I have a huge work project that starts in one week and spans over 4 days. I’ve spent a good portion of this past week just trying to get organized at work, and it seems to be spilling into my crafting life as well. I suddenly seem to be giving myself these goals, goals which have to do with completing projects. So, in an effort to stay on track, this week is going to consist of To Do list progress, and we’ll see how far I can get. First up is the boxy and buttony sweater. I’ve ordered some beautiful buttons for this project, but they aren’t going to be shipped until tomorrow. I don’t know if they’ll come in this week or not. Even so, I’ve procrastinated the end of this sweater long enough. 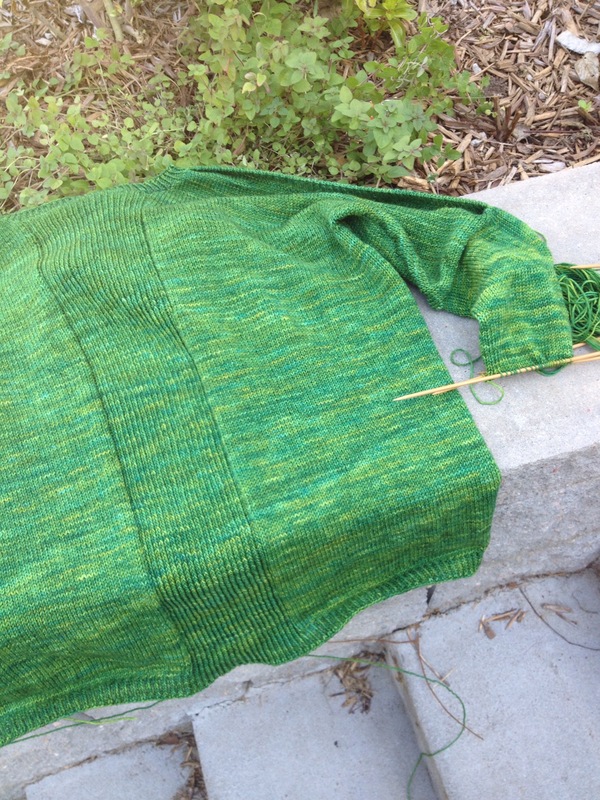 Yesterday I knit the collar of the sweater, and then started a sleeve. Once this is done, all that is left is the second sleeve, weaving in ends, blocking, and sewing on the buttons. I can’t wait to get it done, and pushing myself through now would be a very good idea. If I could get it blocked before the work conference, and IF the buttons come in, maybe I could even wear it. Wouldn’t that be something? I also have the wheel project I’d like to finish, and the spindle project which is close to being done, but I’d like to have the wheel to ply on. Which is why the wheel project needs to get done. I’ll post some spinning progress pictures tomorrow. I hope everyone has had a wonderful weekend. Mine has consisted of a bike ride (FINALLY!) a garden harvest, and a bunch of delicious home cooked meals by Mr. Ink and me. It’s been chilly and fall like, and the chosen activities this weekend have fit that theme perfectly.